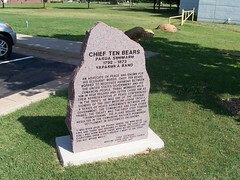 An advocate of peace and known for his eloquent words, Chief Ten Bears worked to negotiate harmony between the United State government and his Comanche people. Tribal members held him in high regard and often chose him as their representative at Peace conferences in the 1800's. He was one of the original signers of the 1867 Medicine Lodge Treaty, a series of peace agreements between the government, the Comanche and four other tribes. 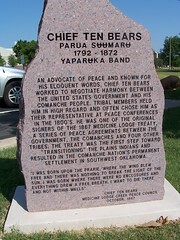 The treaty was the first step toward "transitioning" the plains Indians and resulted in the Comanche nation's permanent settlement in southwest Oklahoma. "I was born upon the prairie, where the wind blew free and there was nothing to break the light of the sun. I was born where there were not enclosures and everything drew a free breath. I want to die there and not within walls." 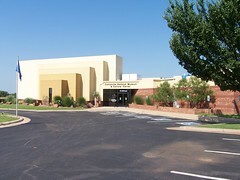 701 NW Ferris Avenue, Lawton, Oklahoma In front of the Comanche National Museum & Cultural Center.